The operetta with lyrics and book by Henry Blossom is loosely based on the 1835 novel Rory O’Moore by Herbert’s grandfather, Samuel Lover. The story is set in 1798, a decade after the start of the French Revolution and the year of the brutal uprisings of the United Irishmen. Convent raised Eileen returns home to Sligo Bay from her formative years in France to the home of her Aunt Maude, an attractive British widow. Barry O’Day, chip off the old block of a legendary freedom fighter father, comes back to lead his cronies in a fight for independence from the British and to reclaim his land, with the anticipated help of soon-to-arrive French forces. Though he’s been flirtatious with the charming Maude, it’s Eileen he loves. Maude is sympathetic to the rebels’ cause, and keeps the English Colonel Lester at bay, allowing Barry to go undercover as her groom. A visiting English fuddy-duddy lord Reggie – who accompanied Eileen from France – adds the comic touch. In the end, the King of England pardons all rebels, and Eileen can marry Barry in a grand finale that unites – at least for the moment – the opposing camps. 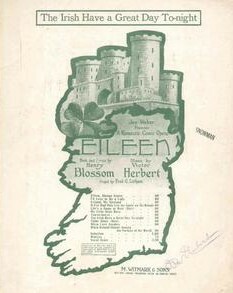 After two Cleveland performances at the Colonial Theatre in January 1917 under the name of Hearts of Erin, the show moved on to Boston, changing its title to Eileen. It then opened at the Shubert Theatre on March 19, 1917 and ran for only 64 performances. It was produced by Joe Weber, formerly of the comedy duo Weber and Fields. It then toured, but a fire destroyed its sets and costumes three months into the tour. Because of its short initial run, the show was rarely revived until 1997, when it was produced and recorded by the Ohio Light Opera, using Herbert’s original orchestrations, reconstructed by Quade Winter from Herbert’s manuscripts, held in the collection of the Library of Congress. 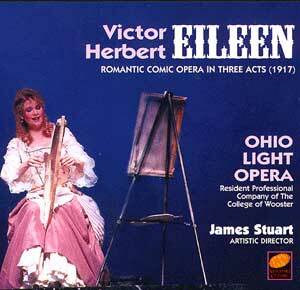 The Ohio Light Opera version of “Eileen,” recorded in 1997. That recording was the first complete modern Eileen. There had been eight highlights recorded by Al Goodman’s orchestra and soloists on a set of 78 RPM records, but these selections have been out-of-print since the late 1950s. Now, there is another new version issued by New Word Records and recorded – how fittingly! – in Ireland with various Irish soloist. The Orchestra of Ireland is conducted by David Brophy, and the sound is much lustier and opulent than the OLO forces on the 1997 recording. The same can be said about the singing which comes across less stilted. However, on the older disc you can follow the story more easily, something that’s a bit difficult on the new version. There are slices of dialogue included, but not enough to make the plot clear. Also, the numbers are often not performed in an especially characteristic or atmospheric way. So you need to guess whether you’re hearing smugglers, freedom fighters, the British etc. Still, when Herbert unleashes some Irish whirlwind dances, all of this doesn’t matter, because it’s so much fun to listen to this music even without quite understanding the context. The heroine, Mary O’Sullivan as Eileen, sounds charming but a bit shrill at the top. Her beloved, Eamonn Mulhall as Barry O’Day, has a very “Irish” sounding tenor with a noticeable quick flicker. It’s appealing, in a folkloristic kind of way, and he creates many intimate moments that are a joy to listen to. He’s also fabulous leading the Irish into the big song-and-dance numbers. 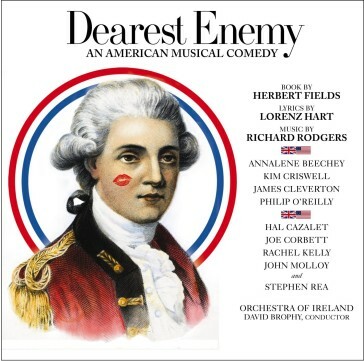 Rodgers & Hart’s “Dearest Enemy” on New World Records. If you compare this New World Records release with their later Dearest Enemy – the Rodgers & Hart American operetta – I find the Herbert works better, because the soloists do not have to battle with double entendres and risqué lyrics. Blossom’s words are straight forward, as is Herbert’s music. And that suits everyone here perfectly. This includes Lynda Lee as Lady Maude, Joe Corbett as Sir Reginald Stribling and Philip O’Reilly as Colonel Lester. If you compare this full-cast recording with full (and rousing) orchestra to the cpo operetta releases, based on concert performances in Austria and Germany, it is striking how much fresher everyone involved here sounds, how stylistically more secure. There could be a bit more character singing, admittedly, to make the story more acoustically appealing. But that’s a minor quibble. All in all, the show is a charmer, and this recording a welcome alternative to the under-energized OLO discs. 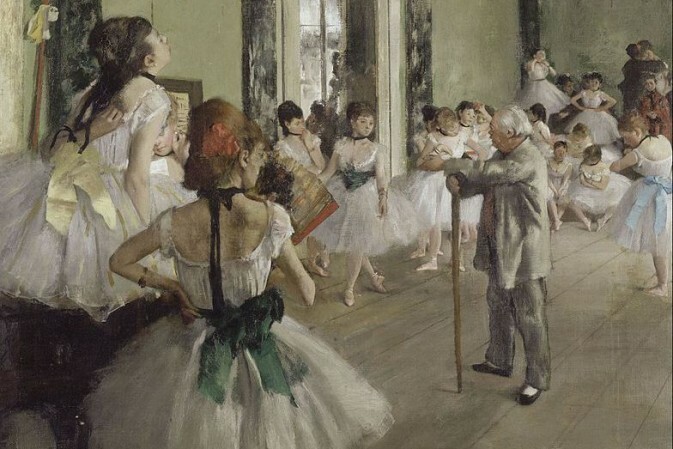 There is an appendix with six tracks, “Cupid, the Cunnin’ Paudeen,” “Hearts of Erin” (opening of act 2), “Stars and Rosebuds,” an ensemble, “Reveries,” and orchestra selections in a historic arrangement by Harold Sanford. 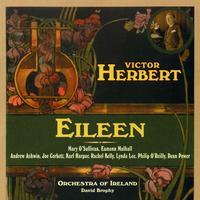 The CD was originally released in 2012, when Eileen was also performed, in March, by the Light Opera of New York (LOONY). 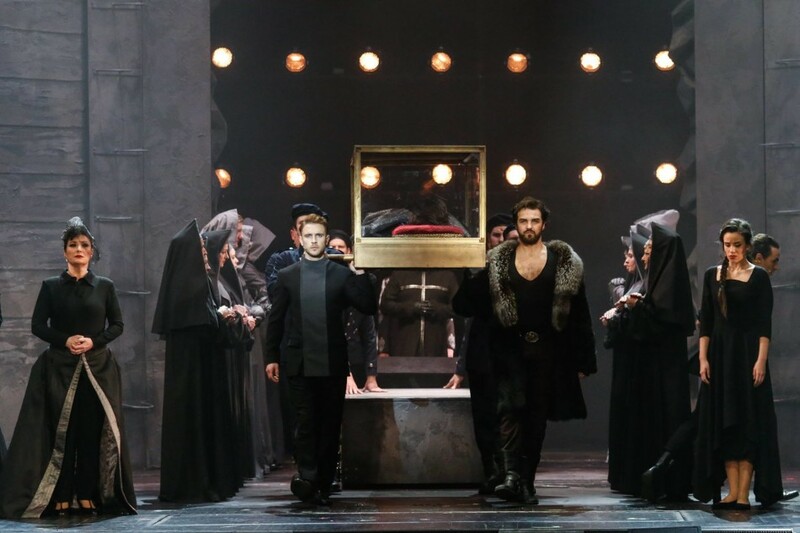 If you want to read about that performance – starring the always-watchable Stephen Faulk as the lead-tenor – click here to read Harry Forbes’s review. Und vielleicht noch ein weiteter bericht zur cd? I apologize for the poor typing. This site needs an edit button.